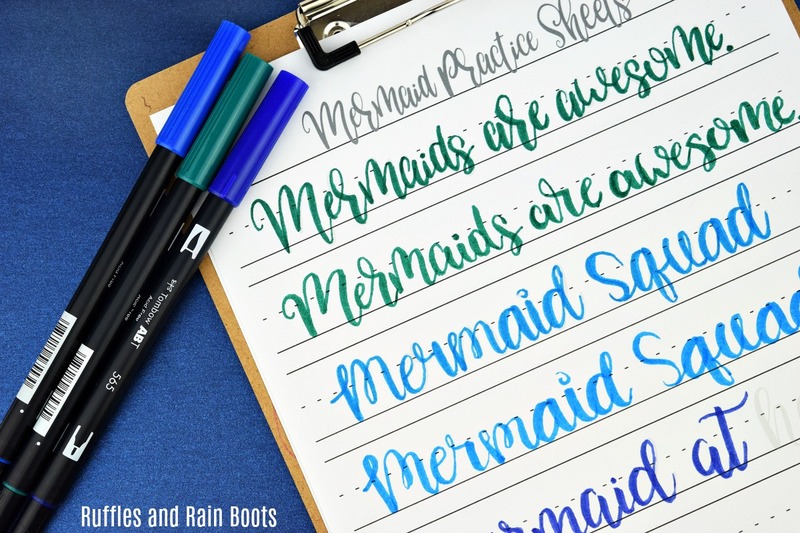 This free mermaid hand lettering practice sheet packs a big punch in the WOW! factor. Small pen, large pen, and even blending practice is included in this free set! 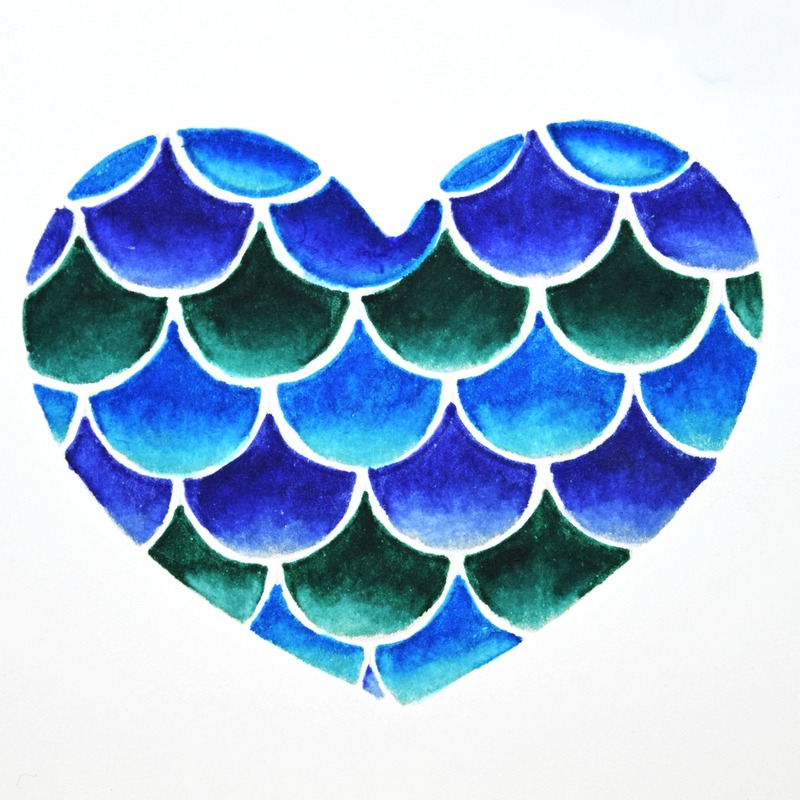 The free mermaid hand lettering sheet is finally available. Squeee! My little girl loves ALL things mermaid, unicorn, and dragons right now. Go figure – maybe you’ll some unicorn lettering practice later. The full set of mermaid hand lettering practice sheets can be found in the shop. Psst: If you sign up for the weekly newsletter, you get a coupon! If you need anything, be sure to check out the hand lettering section of my shop on Amazon. 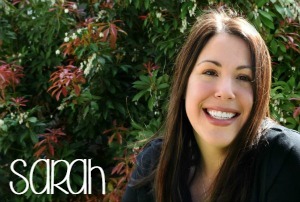 I give you the exact products I use (and I’ve tested soooo many over the years). I’m going to share just a few tips I’ve learned while working on this set. Although it’s handy to have, you don’t need the blending pad. Use a plastic storage bag to blend your pens. I purposefully make the prompts a very light color so that you can practice your blending. Blending colors really brings up the WOW! factor. You can blend on printer paper, cardstock, and watercolor or mixed media. It’s hardest to blend on printer paper because the paper can tear easily. I use cardstock and watercolor paper the most, however, because the paper holds up better. We all have our favorites, and I’m no exception. But I also know that if I’m dedicating part of my days to this, then I need to be sure I work on everything. Psst: chunky bounce lettering with large brush pens is still my favorite! What’s yours? Again, we have favorites but I’ll tell you when it comes to small pen work, I despise – yes, strong word but true – the hard tip Fudenosuke pens. If you like to see a variation in strokes, use the soft pens for the small pen work. I have many of the Tombow brush pen sets and also really like the watercolor brush pens for hand lettering. If you haven’t tried them, they are great for cards, art pieces, and developing a love for blending. 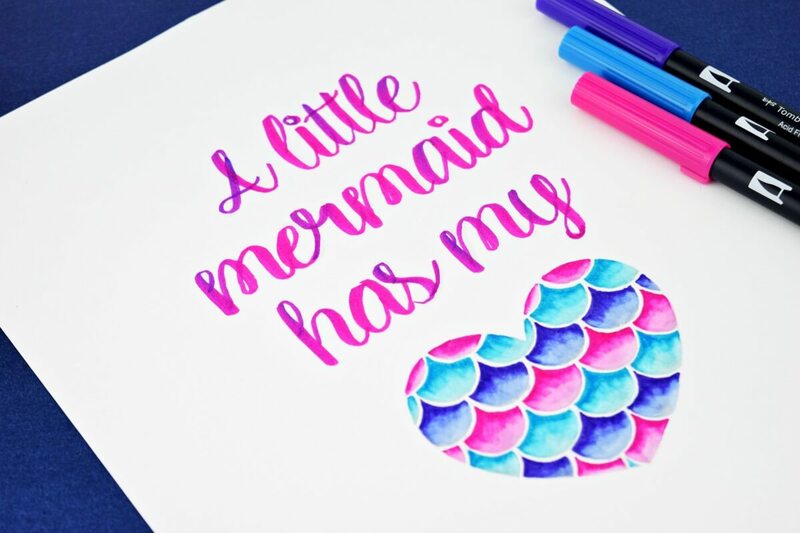 Download the free mermaid hand lettering practice page (large pen) here. 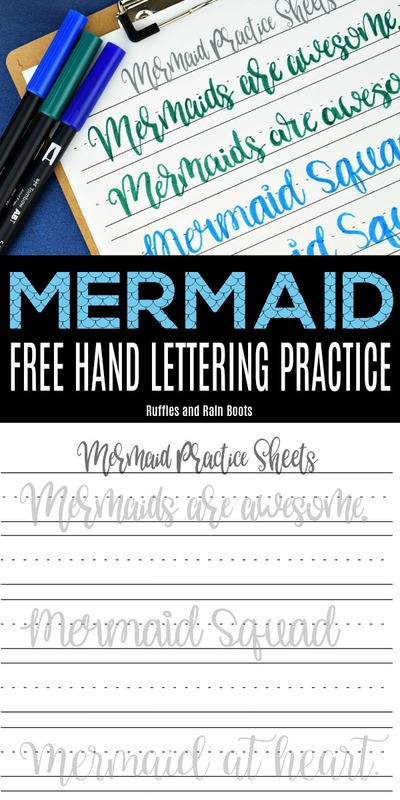 Get the full mermaid hand lettering practice set here for only $2!